Siemens' wind service experts perform remote monitoring and analysis at the new diagnostics center for wind turbines. 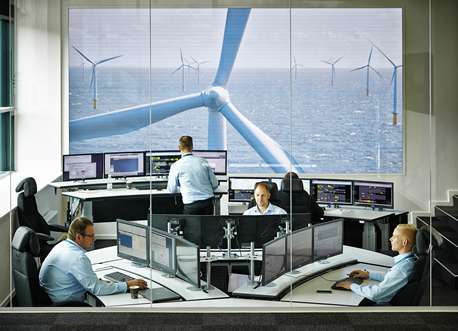 Siemens monitors thousands of wind power plants around the world to operate them as efficiently as possible. The company recently opened a remote diagnostics center in Brande, Denmark, where sensor data from all the plants is watched and analyzed day and night. At the end of October, a total of 7,800 onshore and offshore wind turbines were connected to the center, and they were transmitting approximately 200 gigabytes of data per day. Special analytical models compare that data with the contents of a database that holds over 15 years' worth of recent data from wind power plants. These comparisons help to quickly narrow down, identify, and eliminate the causes of anomalous turbine behavior. The center can predict the failure of parts well in advance and thus prevent unexpected downtime. In addition, these large quantities of data are analyzed with the specific purpose of developing optimizations for the plants.Siemens began monitoring wind power plants in 1998, and since 2000 it has been designing all of its plants for remote troubleshooting. Since 1998, all measurements indicating malfunctions have been recorded in a database that now holds several terabytes of information. Siemens has been monitoring its plants in this way longer than any other company. Today, a plant collects and transmits approximately 3,000 pieces of data in real time using a Web-based SCADA system. That includes weather information, vibration measurements at important turbine parts, the power output, and various operating parameters, such as the temperature of the turbine oil. If the measurements deviate from what is considered normal, the plant automatically alerts the remote diagnostics center. 85 percent of these error messages are dealt with right away online. In the other cases, regional service centers are notified and send technicians. The diagnostics center uses a number of different computer programs, some of which are patented. The Automatic Root Cause Identifier automatically recognizes whether the output of the wind power plant is deviating from the optimum and identifies the cause of the problem. The program can analyze large quantities of data very quickly by comparing typical patterns of the observed deviation with events in the database. The Automated Surveillance program, on the other hand, applies dynamic linear models to sensor data and a large number of previous measurements to derive information about the status of the wind turbine and optimize its settings. Typical patterns of imminent failures can be identified early by analyzing measurements of vibrations at the rotor blade, generator or main axle, for example. Since July 2008, approximately 97 percent of all gear damage was forecast in this way. Any part suffering from wear is then replaced during routine maintenance; this prevents unplanned maintenance trips or stoppages. The data analyses also help to optimize the entire fleet. For example, if they reveal trends for certain types of turbines or show the effects that the location, operating conditions, or operating times have on individual plants, corresponding recommendations can be made for the whole fleet.